Chocolate Peanut Butter Cream Cakes w/Ganache, Double Chocolate Brownies w/Vanilla Cream(gluten free), Cherry Lemon Muffins, Orange Chocolate Chip Scones, Peanut Butter Cookies and more at the Co-op. 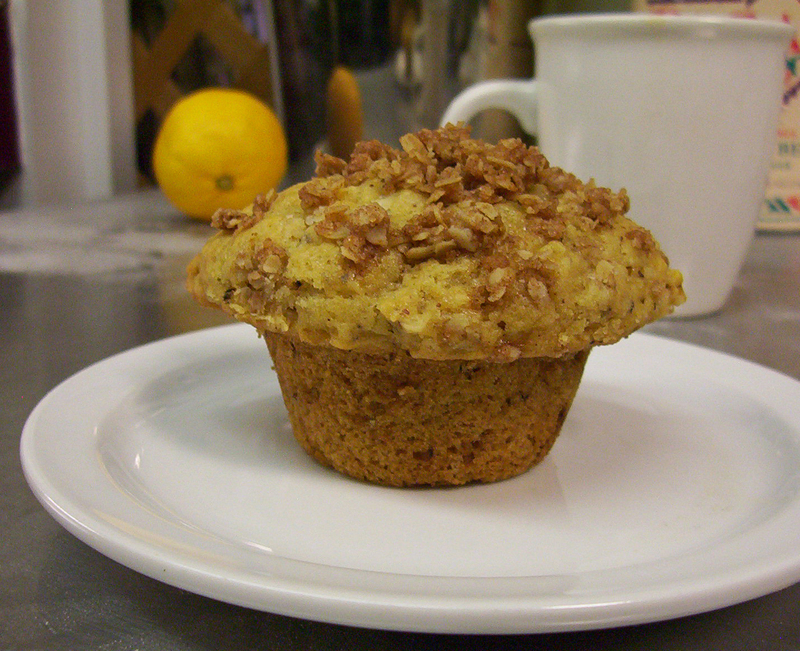 Walnut Streusel Muffins, Peanut Butter Banana Muffins, Chocolate PB Cream Cookies, Peanut Butter Cookies, Cinnamon Raisin Bagels, Lemon Cream Filled Cakes and more at the Co-op. Lemon Cakes w/ Vanilla Cream, Chocolate Cakes w/Vanilla Buttercream & Ganache, Cinnamon Raisin Bagels, Peanut Butter Cookies, Almond Butter Truffles(gluten free)and more at the Co-op. Macadamia Chocolate Chip Cookies, Peanut Butter Cookies, Oatmeal Cream Pies, Sticky Pecan Pastries, Double Chocolate Brownies w/Vanilla Cream(gluten free) and more at the Co-op. Get your Graduation Cake/Cupcake orders placed. We do Mini Cupcakes, Cupcakes, Mini Cakes all the way to large layer cakes. Special orders should be placed at least a week in advance. Sometimes they can be done at the last minute but not always. Vegan Cakes, Gluten Free Cakes, Soy Free Cakes, Nut Free Cakes. We can accommodate most allergy issues. Email TheVenerableBeanATgmail.com for details. Double Chocolate Brownies w/ Vanilla Cream(gluten free), Chocolate PB Cream Cookies, Coconut Lime Cakes, Chocolate Raspberry Cakes, Peanut Butter Banana Muffins, Cherry Coconut Muffins, Peanut Butter Cookies, Macadamia Chocolate Chip Cookies, , Everything Bagels and more at the Co-op! Chocolate Chip Cookies & Cherry Coconut Cookies at the Co-op. Gluten free and Soy Free. Fresh Everything Bagels made with organic ingredients! Individual and 4 packs available at the Co-op. Coconut Cakes w/ Vanilla Buttercream & Z Chocolate Cakes w/ Peanut Butter Icing & Ganache at the Co-op! Peanut Butter Cookies, Oatmeal raisin Cookies, Almond Chocolate Chip Cookies(gluten free), Lemon Poppy Cookies, Oatmeal Cream Pies, Everything Bagels, Cinnamon Raisin Muffins, Lemon Poppy Muffins and more at the Co-op. Chocolate Cakes w/ Raspberry Filling & Vanilla Buttercream, Vanilla Cream Filled Cakes(twinkies), Oatmeal Cream Pies, Oatmeal Raisin Cookies, Chocolate w/Roasted Peanuts & Chocolate Chips, Peanut Butter Cookies, Lemon Poppy Muffins, Dark Sweet Cherry Pastries & Fresh Everything Bagels at the Co-op! Ginger Peach Muffins, Chocolate Chip Cookies, Peanut Butter Cookies, Lemon Poppy Cookies, Cherry Coconut Cookies(gluten free), Double Chocolate Brownies w/ Walnuts(gluten free), Lemon Cakes w/ Lemon Custard & Vanilla Cream, Everything Bagels, Granola Bars and more at the Co-op. Chocolate cakes w/ Vanilla Cream & Ganache( GF ) and Cherry Coconut Cookies(GF) are at the Co-op! Sticky Pecan Pastries, Walnut Streusel Topped Muffins, Everything Bagels, Lemon Poppy Cookies, Peanut Butter Cookies, Oatmeal Cream Pies, Vanilla Cream Filled Cakes(twinkies), Gluten Free Chocolate Cakes w/ Ganache & Vanilla Cream at the Co-op!